Baylor Scott & White significantly reduced its emergency department and inpatient use by partnering with the city of Dallas to increase access to primary care and fitness programs, according to a new study. The Dallas-based health system teamed up with the Dallas Park and Recreation Department to offer a regular dose of medicine, fitness and nutrition. The Baylor Scott & White Health and Wellness Center provides access to primary care, recreational facilities and free, bilingual nutrition and fitness classes that address the barriers impeding low-income families. People who went to the center used the emergency department 21.4% less and inpatient services 36.7% less, resulting in an average cost decrease of 34.5% and 54.4%, respectively, over 12 months, according to the study published in Health Affairs. "If we are reducing emergency department and inpatient utilization, that means people are forming healthy habits, and that's money added back to our bottom line," Dr. Donald Wesson, the study's lead author and president of the Baylor Scott & White Health and Wellness Center at the Juanita J. Craft Recreation Center, told Modern Healthcare in September. Dallas residents who use the wellness center, which is located in a resource-poor food desert, complete a health risk assessment that includes weight and cholesterol measurements. Baylor Scott & White tracks their workout routines through unique identifiers that are integrated with patient records. The primary-care clinic has a full-time physician and physician assistant who work with a social worker to address behavioral needs; a nutritionist on diet issues; and a community health worker who helps improve access to transportation, healthy food and other basic needs. People with certain chronic conditions, such as diabetes, are assigned a community health worker. The average age of the 1,000-plus individuals studied was 51. Most participants were minorities and about two-thirds were uninsured. 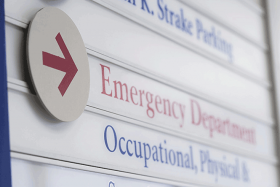 Approximately half of all inpatient hospital admissions, which collectively cost an estimated $697 billion in 2013, begin in the emergency department, according to the study. Funneling patients, particularly low-income individuals, through primary-care and outpatient services rather than more expensive hospital settings has been a tenet of the industry's value-based mantra. But health systems have had varied success. Baylor Scott & White, a not-for-profit health system with 48 hospitals, experienced the learning curve first-hand. In past partnerships, it had guided the efforts without much direction from community organizations. That didn't work, Wesson said. "We had to use trusted agents in the community who can give us the buy-in and be liaisons. That lets them know they can trust us, " said Wesson, adding that Baylor Scott & White collaborated with 27 area churches to help build that trust. "We know a lot about medicine and research, but there is a lot to learn from the community—that has taken us several years to figure out." Baylor Scott & White also worked with local churches to put farm stands in neighborhoods that were in food deserts. It formed a community advisory board, made up mostly of pastors, to maximize their efforts. Other successful population health strategies involve enlisting "culturally competent" community health workers to help patients navigate the system and locating care conveniently in lower-income communities, researchers said. A related study found that providers that form a wide range of informal partnerships can prevent unnecessary utilization and better control costs. Communities with active area agencies on aging, which leverage government and regional funding to coordinate social services for older adults in communities throughout the country, had lower hospital readmission rates, researchers found. The agencies' informal relationships may indicate a denser web of interconnection across community organizations that can help patients transition from hospital care, said Amanda Brewster, an associate research scientist at the Yale School of Public Health. "A close connection with social services can improve health outcomes and reduce the need of episodic care, particularly for the senior population that consumes a lot of services," she said.